This entry was posted on January 3, 2017 by Jessica Anderson. 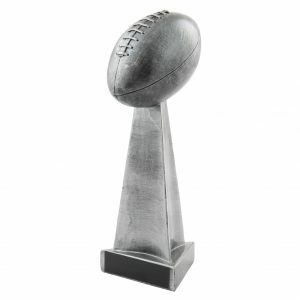 Our Replica Fantasy Football Trophy is a best seller, any winner would be proud to display! The Championship Replica Fantasy Football Trophy was designed by our team at Trophies2Go and is a best seller! Nominated by our engraver Paul, he chose this award because of the high quality, the unique exclusive design, and great value. Our Championship Replica is made of heavy resin with a brushed pewter finish, The two sizes feature a triangle tower with a football at the top. An engraved black aluminum plate is customized with three lines of text. Thank you to our vendor JDS Industries who creates this custom award exclusively for Trophies2Go! For past Product of the Year winners, check out our 2012 Monster Trophies, 2013 Honey Badger Trophy, 2014 Swirl Egg Art Glass award and 2015 Waterford Cut Acrylic Award!